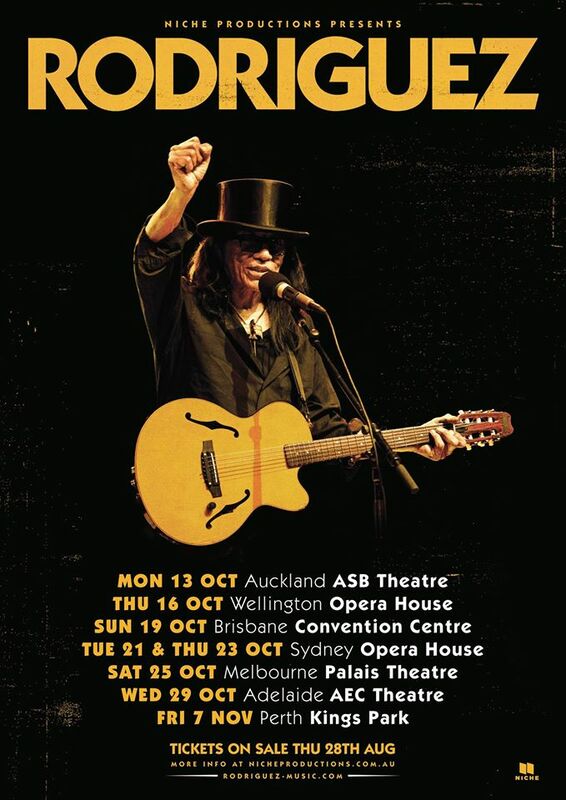 Home › News › Rodriguez to Tour Australia and New Zealand, tickets go on sale Thursday the 28th of August. Rodriguez to Tour Australia and New Zealand, tickets go on sale Thursday the 28th of August. ‹ Things We learned From Twitter This Morning…. Will Rodriguez be visiting south africa again soon? Missed him on his last tour and would love to see this great modest man. Yesterday i saw the film searching for sugar man. Incredible. I never heard about this man and his story. and i loved his songs immediatly. Great! A great Soul. Impressive. i love his Music. i love his words. he is a real poet. don`t miss ´to check out his story and his Music. i wish him the Impact he deserves. and he deserves a lot of Impact an recognition. a lot. So glad he’s doing well and doing what he loves. He deserves the best. Love his music. Would love to see him live, any plans for Europe? I was So Glad to see Him Alive and healthy enough to get a 2nd chance with his music. His voice is much more beautiful than Croce or Dylan. I was upset that more direct questions weren’t asked to the either the S.African rec co. or the Detroit label…someone must’ve contacted Detroit label back then….But to see the man just carry on and be so cool with his life…He is truly an inspiration. Amazing fortune all that hard work in Detroit – walking in snow left him so healthy. I’m so glad he’s still going. Disappointed the Doc didn’t let us know who had rights to his songs and where Us in U.S. could buy them. Now I see the sad news about the man who did the documentary…Jesus…Life can be so hard – sad…to the loss of All of Us. Now I really want to go to Australia. I’m in Australia and it is very hard to get tickets……I knew about him from working in a record shop in the 1970’s. If you want to come to Adelaide, South Australia as there are tickets still available and I have plenty of room for a guest. Unfortunately all the tickets for the opera house concerts were taken by scalpers that are now trying to on sell them @ $400.00 per ticket (Viagogo & Ticketbiz) is there going to be a third concert in Sydney as I need six tickets for six dedicated fans ! !